I began my career in the hospitality industry at the age of 16, working as an usher at the Star Plaza Theatre. After my freshman year at Purdue University in West Lafayette, I moved to Florida for two years. I returned to the region in 1999 and landed a part-time job at the South Shore Convention and Visitors Authority while finishing my degree. I graduated from Purdue University Calumet with a Bachelor of Science Degree in Business Management with an emphasis in Marketing and a minor in Human Resources. My time at the South Shore CVA began in an office support role and I was quickly promoted to Marketing Assistant. I have also held the positions of Sales Manager, Sales & Marketing Manager and Director of Sales & Marketing. After a brief stint as the Director of Marketing for the La Porte County Convention and Visitors Bureau, I returned to the South Shore CVA in October 2005. As the Chief Marketing Officer, I manage the annual marketing budget and the sales and marketing staff. I am also responsible for placing and tracking advertisements and maintaining strong relationships with SSCVA partners and hospitality professionals. I am a resident of Hobart, where I live with my husband, Tony, and three kids, Nathan, Maverick and Peyton. Some of our favorite things to do along the South Shore include walking along the lakefront and through Festival Park in downtown Hobart and visiting Albanese Candy Factory. 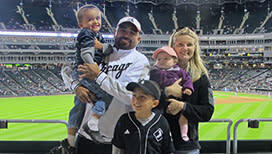 We are also frequent visitors at U.S. Cellular Field in nearby Chicago to cheer on our favorite team the Chicago White Sox.